Autin Dance Theatre was recently formed by French dancer and choreographer Johnny Autin as a vehicle for his choreographic work. Taksim Square reloaded is his first work for Autin Dance Theatre, having previously performed an excerpt of it at Cloud Dance Sundays in July 2013. He will be performing on Friday 15 November, and further details can be found here. Johnny is an extremely versatile dancer, with his abilities ranging from contemporary and street dance to flamenco, and in the last few years, he's performed in works by Kwesi Johnson, Tom Dale, Tamsin Fitzgerald, Freddie Oppoku-Addaie, Gregory Maqoma and Luca Silvestrini, to name just a few. 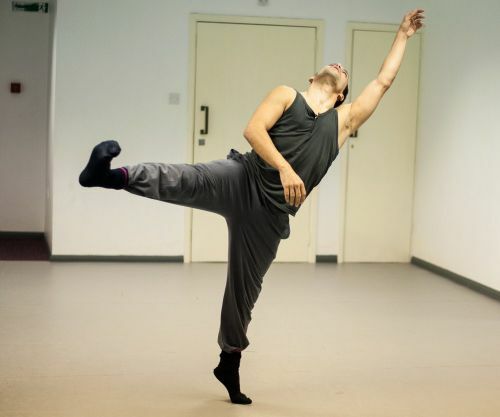 Having impressed audiences worldwide for the last few years in leading all-male urban contemporary dance company 2Faced Dance, Johnny decided to go freelance earlier this year and has since been in heavy demand, both as a dancer and as a choreographer. He is now based in Birmingham, and will also be performing in works by Rebecca Namgauds and Adam Rutherford on 15 November. Although Johnny has only recently switched to being an independent dance artist, his successful career as a dancer - for companies including 2Faced Dance, State of Emergency and Harnish Lacey Dance Theatre - has also included choreography, teaching and commissions, which he is continuing to work on now that he is freelance and based in Birmingham. Birmingham seems to have been an excellent choice for him, with a thriving yet intimate dance community and the chance to work with and be supported by DanceXchange. Having performed in works by an illustrious list of choreographers, and worked extensively as a rehearsal director, Johnny has very set ideas about choreography, about how it is the sum of other parts - eg costume and music - with choreography simply "fleshing out the bones". Many choreographers approach choreography the other way round, so it will be interesting to see a work with that level of attention to detail. This will be Johnny's third Cloud Dance Festival performance (and fourth Cloud Dance performance), but his first time for presenting his own work: he last performed in Dream On and Trilogy in 2008, and we're really pleased to be supporting him again.